Over the past twenty years Contibelt has delivered belts to many customers all around the globe. We always try to explain to our customer why they should not repair cracks or steel belt damages themselves. Some of them ignore us, and then wonder why the repair did not work out. 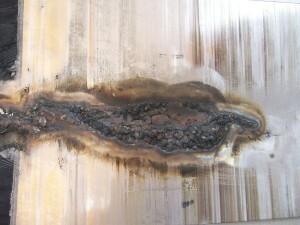 Self welded crack from a customer. For repairing cracks, or any kind of damage on the surface of a belt, it is necessary to have special equipment – most of it you can not buy in a regular store. Our maintenance personal is specially trained for this work – and you have to be specially trained because it is easy to ruin the belt during the process. And even if you manage to weld a crack, you need to have a specialist who flattens and polishes the welding seam and checks the belt tracking on the machine. So, as you can see, it is not easy to do this without special help from us. There are many different steps and cautions to take until the belt is ready to be used again. If anyone could do this, we would not have to train our service techs for more than three years! If the self-repair goes wrong, we may be able to help you out, but in some rare cases it is necessary to throw the belt away. Unauthorized repairs on a Contibelt steel belt will also result in voiding the warranty – this may cost you more than calling Contibelt in the first place, so think twice about it. Learn more about this topic in next weeks linkedin post!